Harmonia Philosophica is a non-commercial educational philosophy portal written and managed by Spiros I. Kakos (Gr. Σπύρος Ι. Κάκος). Its goal is to show that dogmatism, under any form, is wrong. And even though dogmatism had for a long time been associated with religion, things have drastically changed in the last centuries. Nowadays science has replaced religion in the throne of doctrinaire thinking and the poison of materialism has dominated human intellect to a great extent. Dogmatism in science – which holds the throne of “thinking” in modern West – is something we should all worry about. This is not being against science though, since we must always remember that true science embraces all views and cultivates free thinking. In this portal one can read how separate opinions on crucial philosophical matters can be merged into one single “truth”, if such thing even exists. The point of every philosophy entry is to illustrate that one-way thinking is never correct – most of the times a combination of science and religion, measurements and theoretical thinking, logic and intuition, is required to draw a conclusion. the Harmonia Philosophica philosophy program has delivered in its very short life more than anyone would ever expect. A list of some of the best Harmonia Philosophica articles can be found here and here. Spyridon Kakos [Σπύρος Κάκος] is a chemical engineer located in Athens, Greece [http://www.linkedin.com/in/skakos]. He is currently working as an IT Consultant in a big IT Consulting company. He develops software solutions and contributes to the online open source community. He holds a PhD in the Advanced Materials Technology sector, for the use of conductive polymers in the PCB industry, an MBA in Decisions Science and an MSc in Advanced Materials’ Science and Technology. He is the creator of Huo Chess, one of the smallest open source micro-chess programs available. He is writing about philosophy for many years and has been managing the Harmonia Philosophica philosophy program with extreme success. 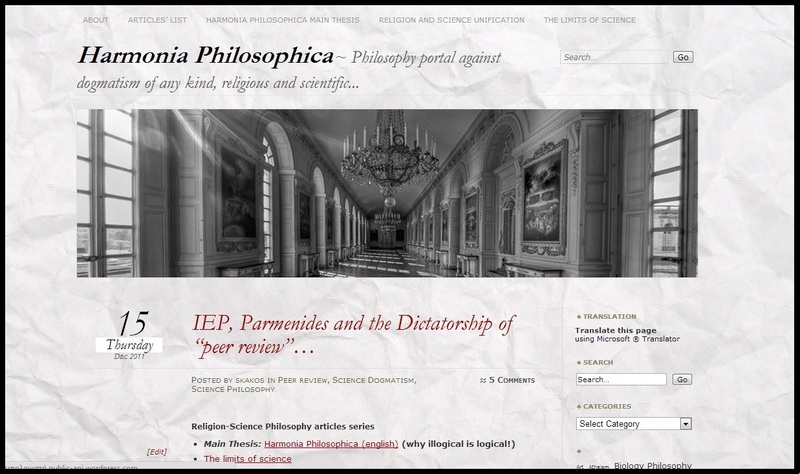 Spiros has been the chief editor of Harmonia Philosophica portals (harmoniaPhilosophica.com, harmonia-philosophica.blogspot.com) since their foundation and is profoundly interested in Religion and Science philosophy. He believes that science and religion are two sides of the same coin; both are needed to understand the cosmos. His philosophical work is mainly concentrated on an effort to free thinking from the chains of “logic” and reconcile all philosophical opinions under the umbrella of the “One” that Parmenides – one of the first thinkers – visualized. Harmonia Philosophica operates several websites including harmoniaPhilosophica.com, harmoniaPhilosophica.wordpress.com and harmonia-philosophica.blogspot.com. It is Harmonia Philosophica’s policy to respect your privacy regarding any information we may collect while operating our websites. Any article of Harmonia Philosophica can be freely re-used, re-distributed or re-published (in part or in whole), if the source of the article is clearly indicated. All the articles in this portal are unique and original, written by Spyridon Kakos. 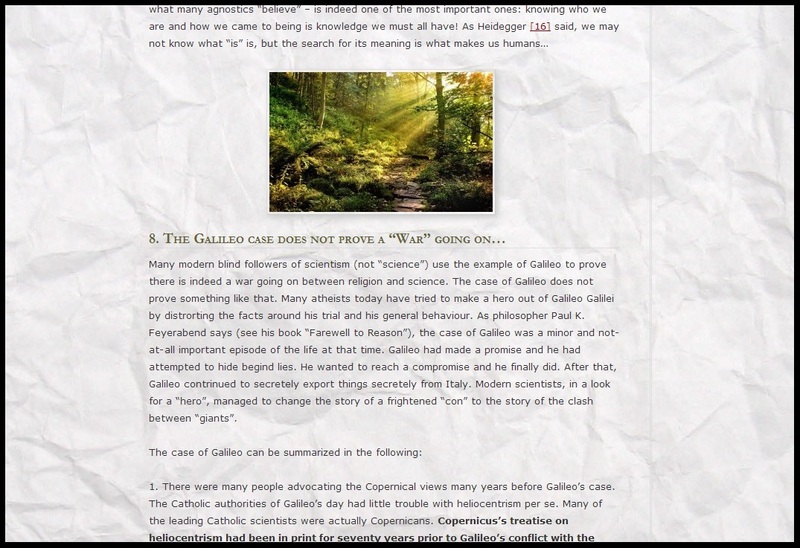 For the articles sometimes small summaries of scientific articles are used, always with reference to the source. Note that these scientific articles serve only as the motive to write about philosophy and are never the main protagonists of the articles; that is why these scientific articles used are sometimes more than a year old. As mentioned above, the Harmonia Philosophica portals’ goal is educational. Images used in the articles are drawn from the Internet, with extensive care to use only free images. In case you are the rightful owner of a picture used and wish the image to be withdrawn, please contact us at skakos@hotmail.com. Please contact us at skakos@hotmail.com for potential cooperation. Such cooperation could include the writing and posting of articles, cross-referencing, production of podcasts or videos or even the organization of events to discus philosophy of religion and science! Thank you for your website, so unusual and refreshing with regard to its content and it’s basic attitude. I could not find any reference to whether or not you allow your articles to be reproduced either in whole or part. I would very much value your permission to use some of your article on the place of the earth in the universe. Extremely happy to have found this your site: a pure strike of luck. I am amazed to see that you have been covering almost the same subjects that have been my focus of interest for the past ten years or so. I come from a different perspective than the philosophic one, but, like you, I have been criss-crossing through all that science – particularly, edge science, in the hopes that it will help me understand my own experience. Unwarily I dropped into consciousness, considerations on the reality of free will, morphogenetic fields, synergetics, catastrophe-chaos theory, systems theory… But I have been less generous (rather “cowardly”) in sharing it all through a blogsite; I have barely began doing it. Thanks for the comment! I would be more than happy to hear your thoughts on the matter. What is your blog? Thank you for the response – I feel bad for not answering promptly, as I keep on postponing for a “better, proper time” – fact is that I keep postponing and that time is hard to come. I do intend to write a few lines with my thoughts about the role of the collective in mass-producing human shambles, but, aren’t they evident?? The lower-than lowest standards in our medias, the tv, the games, the education system, the failed family because failed society, the big face of untruth, falsity and pretense grinning everywhere its large, callous grin, but firstly, I accuse the main point of reference, mainstream science, for denying the true nature of the soul, thus non-allowing a more intelligent approach (in fact, the only approach!) – that of respectfulness in confronts with the individual and with human society at large, with nature, with the planet. I would be only glad if you could have a glimpse at my site, but was participating in Blog 101 this January 2015, and it’s been in a very bad shape since – not anyone’s fault but mine. I am currently trying to re-organize and make it open to visits. Science and logic are really the only known way to get verifiable answers about the external universe. Philosopic discussions about metaphysics and the ‘meaning of reality’and epistamology ‘verifiable knowledge’ have been going on for thousands of years; but they seem to go round and round. Sure I will be glad to take a look. Which is your site? I’ve read a couple of your articles now, and I agree with the way you think. Your article on Agnosticism really knocked some sense into me. I have but one more question (for now): What do you believe? I believe that the irrational has more to give us than the rational. I believe that logic has inherent limitations, while on the other hand intuition and fantasy are what help us see the Unity of the cosmos. I will keep my personal religious beliefs for my self, but I can surely tell you that I believe a First Mover exists. Or at least it is logical to say that he (she? it?) exists? Logical? But I said before that I also believe in the irrational. Well. Then this should be part of my irrationality. In any case I do not discard logic alltogether – I believe logic can provide us some answers (though limited). But the answers to the most important questions are given to us by other means. As a human I feel that I am something more than bones and flesh. And that is why I constantly try to elevate my self from the level I am in right now. Read “Harmonia Philosophica” main thesis (http://harmoniaphilosophica.wordpress.com/2011/05/08/harmonia-philosophica-english-2jszrulazj6wq-92/). I would love to hear your comments about it. Yes, you are right that paradoxes are everywhere! The point of every…one-way thinking….isn’t that kind of one-way thinking? It’s interesting that to hold that dogmatism is wrong is to believe in the dogma of non-dogmatism. It’s a contradiction. It’s like saying there are NEVER absolutes, which in itself is an absolute – your web page is paradox. You also question whether truth exists, but then claim that one way thinking can’t be the answer, which means that idea is a truth to you. Unless, of course, you can admit that one way thinking may in fact be right, but if left unchallenged we will never know if it is. Odd little spot we find ourselves in, isn’t it?